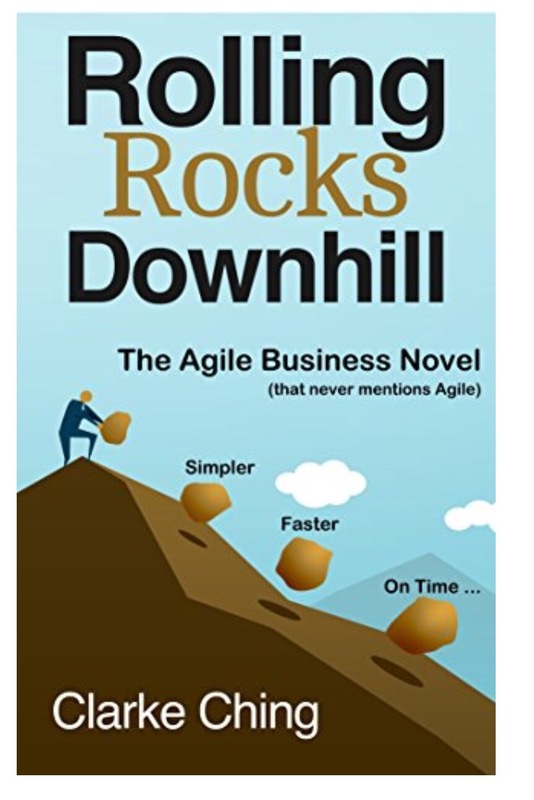 I read Clarke Ching‘s book Rolling Rocks Downhill a while ago and I picked it up again recently while on holiday. I’d enjoyed it the first time, going back over the story a second time with a little more leadership experience I was amazed just how many valuable lessons Clarke has managed to cram in there! The book is a Business Novel and follows Steven, the Development Manager at Wyxcomb Financials who discovers that a competing company has stolen their idea and is determined to beat them to market. Their project on the other hand is behind and likely to slip even further. With their company’s future at stake Steven must develop a new approach to development to save the day. What follows is a story of a team discovering Agile ideas and practices for themselves. Not because they have a guru preaching at them, but because they’re trying to solve real business problems. I couldn’t help chuckling at some of the discussions Steven has with his mother, the Product Sponsor, and even the Cafeteria Manager as he learns about Iterative Releases, Product Backlogs, Continuous Testing and the Theory of Constraints. After all can you really understand the advantages of building a small number of features in an iterative manner if you’ve not heard about the French Fry Revolution!? An easy read and a great book to really reinforce some of the ideas of scrum you already know with real world examples. Recommended to anyone!